A Successful life is a life that is whole and balanced. Every aspect of life is complete. Seeking to improve just one aspect of life can leave you disappointed. Lets use your car as an example. You are driving down the road to an important meeting, suddenly, steering the car becomes difficult and you hear a thudding noise. You realize that one of your tires has gone flat. You pull to the side of the road, upset, you are going to be late. You think, I am just a block away from my meeting, do I just continue to drive my car? It will ruin the tire and it will take me more time to get there or do I wait for someone to come by and help me? You see when you are driving on all 4's your life is whole, everything runs smoothly. When just 1 element is not working it throws a kink into you plans and life. the support and love from a group of people (Family). So when seeking to improve your life look to create wholeness in every aspect of your life. Write your affirmations with each one of these life stations in mind. Take your Feng Shui with you. This feng shui cure will transmute hard "Sha" energy from the road into beautiful colored "Chi" in your car and you don't have to worry about it cracking your windshield. This is one of my favorite cures. The main purpose of faceted crystal balls is to transmute energy. The balls must be faceted and the size depends upon the size of the ailment you are trying to cure. A small window approx 2' x 4' would take a 20 mm ball. A window 4'x4' will take a 30mm ball. Anything larger will take a 50 mm ball or a couple of 30 mm balls. When "Sha" or hard energy enters the ball, the facets deflect the energy breaking it up and turning it into "Chi" or soft energy. Crystal Balls are typically used in windows to transmute the "Sha" entering your home from the street. They can also be used in an entryway or long hallway to slow down the energy. The size of the crystal ball you choose is dependent on the size of the ailment and the amount of energy you are trying to transmute. In a hall or entry that is 36" wide you can use 20 mm balls, hang them approx every 4'. In a hall 48" wide use 30 mm balls and hand them every 4'. In halls 60" wide or large use 50mm balls and hang them every 5'. Mirrors are one of the most utilized cures for Feng Shui ailments because they are so versatile. Mirrors can be used to reflect and attract energy. They are also used to bring things together. The Ba-Qua Mirror is an eight sided mirror. Each side represents an aspect or lifestation. The Ba-Qua Mirror shown below is unique in that is has been programmed by a Feng Shui Master with ancient Tibetan symbols to bring harmony and abundance to all of your life situations and protection to your home by pulling in all positive good luck "Chi" and reflecting the "Sha" or negative "Chi" away. When you open your front door it creates a vortex drawing in all of the "Sha" energy from outside into your home. When this mirror is placed outside your front door the "Sha" energy is transmuted into "Chi" before it enters your home. This is the only Ba-Qua mirror in the marketplace that will do this. The Ba-Qua Mirror is used to improve the "Chi" of your home. The mirror has been programmed with ancient Tibetan symbols to bring harmony and abundance to all of your life situations and protection to your home by pulling in all positive good luck "Chi" and reflecting the "Sha" or negative "Chi" away. The mirror is eight sided. Each side stands for one of eight life situations: marriage, fame, wealth, family, career, new knowledge, helpful people and children. 7" in diameter. Includes instructions on use and proper Feng Shui Placement. 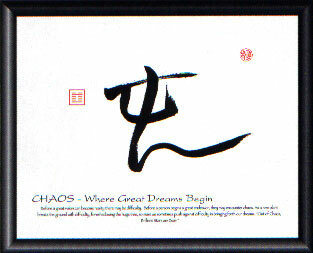 There are two forces in Feng Shui, "Sha" and "Chi". Neither is bad for you, however too much of anything is not healthy for you. "Sha is hard energy like the energy from a Jet Plane. Now, that plane can be very good for you if you need to get somewhere fast, however, the "Sha" energy from a plane is hard on you and is not something you what to do all the time. "Chi" is soft energy like the energy from a babbling brook. This energy is very healing and makes things grow. This is the easiest energy to be around. 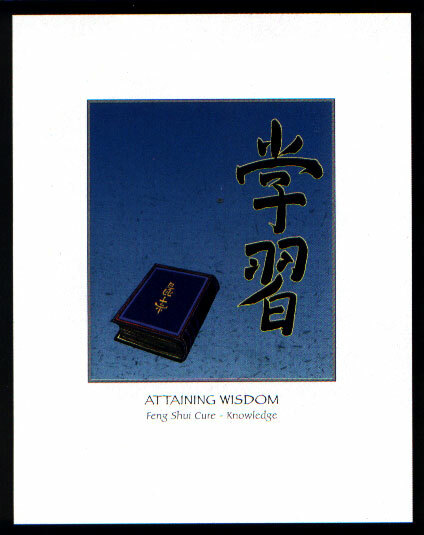 In Feng Shui there are ailments and cures. Aliments are harmful energies that cut your energy field and weaken you, like "Sha". "Sha" does not necessarily have to be as dramatic as a jet plane. It can be as simple as harsh words, energy from cars and structural elements from buildings. Cures are the things you do to heal "Sha" or transmute it into "Chi". Below are two products that come with curing tools and complete instructions on "How To" complete a basic Feng Shui. If you love the Basic Cures kit, this is where you purchase refills. The Feng Shui Basic Cures Refill Kit includes 4 red envelopes, (4) 1" mirror squares with adhesive tape, a sheet of red dots, (3) Chinese coins and instructions on Feng Shui uses. The proper placement of these cures will enhance your life force by protecting you from the cutting electromagnetic fields in your home. Mirrors are one of the most utilized cures for Feng Shui ailments because they are so versatile. Mirrors can be used to reflect and attract energy. They are also used to bring things together. They are used to complete missing corners or reflect "sha" energy. 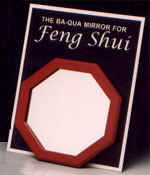 The Mirror Squares are used as cures for many ailments in Feng Shui. The package includes (4) 1" square mirrors with adhesive backs for indoor use. These mirrors may be used outdoors but will require a silicone adhesive. A package of 4 mirrors will be sufficient to complete a missing corner of your home, reflect the sha energy of a waring cook top and sink, reflect energy back off of a step and cure many more ailments! Bamboo represents strength, endurance and power. The flute is the creator. The flute emits sound that goes on for infinity. This sound carries the energy field for your desires. Bamboo flutes can be used to add the qualities of strength, endurance and power to one of your life stations. They can be used to create an energy field of your desires or they can be used to cure structural ailments. The Bamboo Flutes below are designed with complete instructions on use and rituals are included. Do you have exposed beams in you home? In the science of Feng Shui, structural elements such as exposed beams, create electromagnetic fields that cut and drain your energy field. If you are exposed to this harmful "sha" for extended periods of time it can be very damaging to you health and mental attitude. The flute cure is designed to cure this ailment. This cure consists of two flutes with red cording, tassels and an ancient ritual to implement this cure. The ritual is very important in this cure and is necessary for it's proper application. Our home is our safety net. The place where we go to unwind and replenish ourselves. The Feng Shui Protection tool will create and energy for your home or office that protects you from negative "Sha" energy. It will create an energy field around your space of protection. With this tool those who intend harm will pass you by. The Feng Shui Protection Tool is constructed of three flutes with red cording and tassels and comes with an ancient ritual for protection of your home and office. The three flutes represent the trinity universe. The two angular flutes radiate peace and protection up to the universe. The horizontal flute is the guardian of your desires. Your home is an extension of you. These physical locations house the energy (the electromagnetic field) that you have created for that station of your life. What you create in your home is what you will create in your life. After you have created your life desire in your home, it will manifest in your life. Be careful what you ask for, for as long as you believe that you will receive it, you will! The quartz clock is perhaps the most familiar device using the mineral. A quartz clock uses an electronic oscillator that is made of a quartz crystal to keep precise time. If a quartz crystal can run a clock just think what it can do for you. These crystals have been programmed for each of the life stations: health/family, prosperity, children/creativity, new knowledge, relationships, helpful people, career and fame. Use them in any of these life stations to add powerful energy to help you in manifesting the desires of your heart. The Half Moon & Sun is a powerful energy tool that gives energy to the space and represents the cycle of completion. 100% of our life force comes from the sun, whether it is directly from the sun, a reflection of the sun off of the moon or stored sunlight in food. We have all heard the Phrase �the sunny side of the street�. By placing a representation of the Sun and Moon in your space you will constantly be receiving sun energy. The cycles of the Moon and Sun move the oceans, controls the seasons and cycles of life. Subtly, we feel these powerful cycles daily and monthly. Every day the Sun comes up and when the Sun goes down the Moon shines and when it recedes, the Sun comes up again in the morning completing the cycle. Every month the Moon rotates around the Sun, another cycle of completion. The Half Moon & Sun represent these powerful cycles and when place properly they will assist you in completing missing corners in your home or completing and finishing projects, goals and objectives in your life. The Half Moon & Sun framework is 10� of copper wire. 10 is a higher level of completion and new beginnings and copper is a magnifying agent. The Moon crystal is 50mm and the Sun crystal is 30mm. The total height of the product is approx. 10�. The science of Feng Shui uses the Ba-qua shape and the eight stations of life: prosperity, relationships, helpful people, new knowledge, family/health, children/creativity, fame, and career. Each one of the life stations directly correlates to a location in your home. Your home is an extension of you. These physical locations house the energy (the electromagnetic field) that you have created for that station of your life. What you create in your home is what you will create in your life. What happens in your life is what you created in your home, so if you are having problems in your life you must first look to your home to solve these problems. After locating your life stations you can create your life desires by using energy and symbolism in your life stations to first create your life desire in your home. After you have created your life desire in your home, it will manifest in your life. Be careful what you ask for, for as long as you believe that you will receive it, you will! 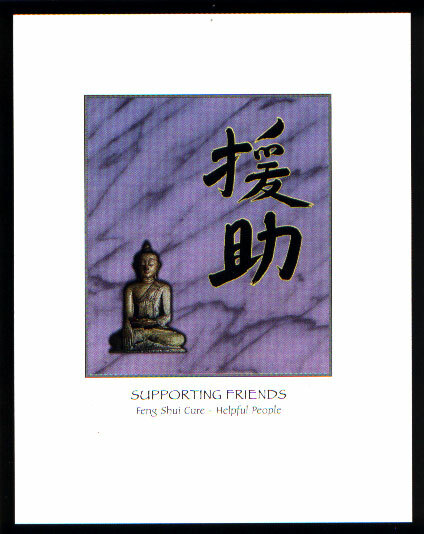 The Feng Shui Wallet Card diagrams the eight life stations and includes instructions on locating the life station in your home and how to use these stations to create harmony and abundance in your life. 3 1/2" x 2 3/4", laminated. Are you looking for love or prosperity in your life?. Have you had a difficult time drawing in satisfying relationships or prosperity ? This beautifully packaged collection of love and prosperity magic will help you in your quest for attracting love using the ancient science of Feng Shui. With this kit you will learn how to create the relationship and prosperity you desire. This kit utilizes the principles of Feng Shui and includes everything you will need to manifest Love and prosperity in your life and will help you to Identify your relationship and prosperity corner, clear the corner of the old and bring in the new, define what it is you are looking for, write clear affirmations, create and environment for acceptance, appropriately place symbols, use aromatherapy, and burn candles. All of these elements are critical for creating what you desire instead of settling for patterns repeated from your past. The Love package includes: Affirmations Scrolls, Affirmation Pouch, Golden Heart Talisman, Attracting Love Aromatherapy, Aromatherapy Heart Diffuser, Candle and a Crystal Programmed by a Feng Shui Master for Attracting Love. Complete instructions on how to write love affirmations and instructions on how to use each item. The Money package includes: Affirmations Scrolls, Affirmation Pouch, Chinese Coin Talisman, Attracting Money Aromatherapy, Aromatherapy Money Diffuser, Candle and a Crystal Programmed by a Feng Shui Master for Attracting Money. Complete instructions on how to write prosperity affirmations and instructions on how to use each item. A fun and playful deck of 46 cards that heal and re-program the inner child through words and scent.ssential oils are catalysts for awakening your emotions.You will be inspired with conscious thought patters that create the effects of oils and heal the soul. These inspirational reference cards area practical resource for bring essential oils into everyday life. Shuffle the cards and select one card for the day. Read the conscious inspiration aloud with passion and purpose.Turn the card over to see what oil to use for the day and how to use it. Aroma is an important element in the manifestation of your desires. Aroma will stimulate your senses to assist in the reprogramming of your subconscious. The attracting Prosperity aromatherapy has been created using those elements that stimulate your subconscious to attract the physical manifestation of Prosperity into your life. Use it every 4 days on checks, wallets or anything relating to wealth. You can wear it daily as a perfume or heat it on a red candle to attract love. Everything you need to start the Feng Shui on your home is included in this package; Stakes, mirror square, crystal balls, 20 mm, 30mm & 50mm, a Bagua Mirror, Bamboo flutes and Protection Tool. Candace Czarny, CFM, LEED AP, ASID is the president of Wind & Water Inc., a Certified Professional Interior Designer with over 25 years of experience in residential and commercial interiors, a Leadership in Energy and Environmental Design Accredited Professional, a Board Certified Facility Manager and a Feng Shui Expert. She is a member of the United States Green Building Council, International Facility Managers Assoc. and a Professional Member of the American Society of Interior Designers. Candace holds a Bachelors Degree from Virginia Polytechnic Institute and State University (VA Tech). She has completed a 5 year apprenticeship with Feng Shui Master Tony Cuneo. Discover Your Direct Line To The Divine. Sound has always been consider a direct link between humanity and the divine. The ancient mystery schools all taught their students the use of sound as a creative and healing force. Now, SCARED SOUNDS reveals to today's seekers how to tap into the magical and healing aspects of voice, resonance and music. On a physical level, these techniques have been used to alleviate aches and pains, lower blood pressure and balance hyperactivity in children - On a metaphysical level, they have been used to induce altered states of consciousness, open new levels of awareness, stimulate intuition and increase creativity. "... an exciting book that brings together the resonances found in the spoken word, music and sound in order to create inner balance and healing. His extensive appreciation of the subtleties of tone give us a greater understanding of the myriad of ways we are each influenced by sound and the effect on our chakras and lives. Fascinating reading that gives you a lot to think about"
"It's a fun handbook. Ted Andrews has done his homework. He recapitulates some of the most interesting ancient beliefs in the power of sound and music. Consideration of these mystical traditions brings greater awareness to the new emerging science of vibration and transformation. Based on the theories of YI Ching and the five Chinese tones, this Feng Shui music is designed to help people improve their life through the energy released from music. The proper cycle of arrangement of the five elements generates productive "qi" circulation in the human body and the living environment. 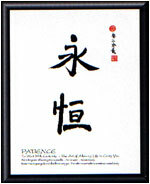 Each element is related to one of the five tones of traditional Chinese music. The combination of corresponding elements and tones can release a powerful energy that opens the door to a new world of health, luck and happiness. The tortoise is revered as the god of the north, associated with water in Feng Shui theory; this element possesses the qualities of flexibility and resourcefulness. Water is related to yu of the five Chinese tones, which acts on the kidneys. In the eight trigrams, the kun trigram is assigned to water. The tortoise in the north is embodiment of the water element and has a remarkable ability to tame the primitive part of human nature, restrain excitable temperaments, create possibilities for wealth, and prevent fatal dryness of body and spirit caused by an excess of mental. 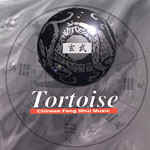 The music of Tortoise is intended to unbind water energy, so the composer drew material from folk music of northern China, centering on the yu tone. Water is a symbol for money in Chinese culture; on this album you will bear soft and relaxing music, which sounds like gentle flowing river that brings fortune and wealth. You will also hear Mongolian folk music that describes how water nourishes the people living in the dry desert land of the north. The Phoenix is revered as the god of the south, associated with fire in Feng Shui theory. Fire signifies passion and intuition, and represented by the jyy tone, which can act on the heart. 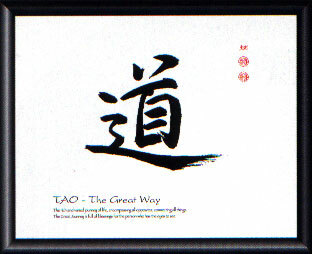 The fire element is also linked with the li trigram, which signifies beauty, brilliance, and grandeur. Chinese people believe that this mythological bird of the south embodies all characteristic and function of fire. The phoenix stores energy of fire, which, when released, gives light and warmth to the world and nourishes all creatures. The music of Phoenix is designed to release fire energy to adjust the Feng Shui of the environment. The composer uses music of southern China and the exotic tribal music of southwestern China. People living in this area have very bright and lively regional traditions; fire plays an important role in their festivities. Celebratory music is played by plucking stringed instruments and striking percussion instruments. The music of these southwestern tribes is pleasurable and full of high-spirited gaiety. The tiger is associated with the west, in Feng Shui, the west is associated with mental, which has the characteristics of cleanliness, integrity, and strength. Therefore, the energy of the mental elements guards against evil spirits and stagnant Chi. Mental is associated with shang of the five Chinese tones, which acts on the lungs; it also corresponds with the qian and dui trigrams. 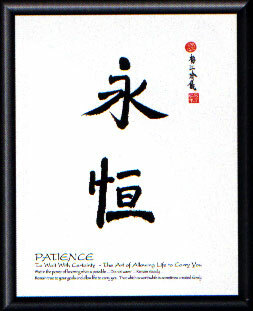 Qian represents heaven, and signifies vastness, masculinity, and strength; dui stands for joy, happiness, and satisfaction. Tiger shares these attributes, and generates powerful energy which can bring good luck to the household and make family members healthy, high-spirited, and productive. Through music based on the shang tone, the energy of mental can be released to benefit the listener. The composer uses folk music of the northwester China, where the native inhabitants are primarily nomadic Turkish-speaking Uigur people. Other ethnic group in this area include the Turkish Timur (known as Tamerlane in English) and the Tibetans. Living in this barren and desolated region, these people have to struggle to survive in the harsh environments; therefore, they possess great vigor and valor. These qualities resemble the attributes of mental and are evoked in the music of this album. Relationships and Helpful People into your life. The science of Feng Shui uses the Ba-qua shape and the eight stations of life: prosperity, relationships, helpful people, new knowledge, family/health, children/creativity, fame, and career. Each one of the life stations directly correlates to a location in your home. Your home is an extension of you. These physical locations house the energy (the electromagnetic field) that you have created for that station of your life. What you create in your home is what you will create in your life. What happens in your life is what you created in your home, so if you are having problems in your life you must first look to your home to solve these problems. After locating your life stations you can create your life desires by using energy and symbolism in your life stations to first create your life desire in your home. After you have created your life desire in your home, it will manifest in your life. Be careful what you ask for, for as long as you believe that you will receive it, you will! 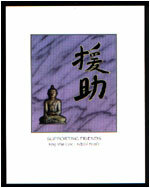 These prints have been specifically designed to empower your life stations with energy. They make great gifts too! 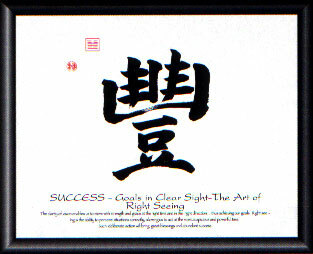 Specially designed art prints use ancient Feng Shui symbols combined with specific color and calligraphy designs to serve as powerful Feng Shui cures. These prints are an easy way to create cures for homes or offices. Prints are published on recycled, heavy grade poster stock and are framed in a black wooden frame under glass ready to place. Placement instructions included. All prints measure 11" x 14", finished frame size 12" x 15". 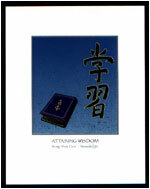 Let "Seeds of Wisdom" inspire, uplift and move you forward on your life's Great Journey. Prints are published on recycled poster stock, framed in a black wood frame under glass ready to place. All prints measure 9.5" x 12". 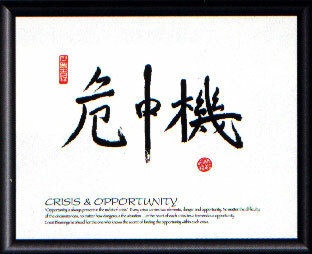 finding the opportunity within each crisis. The clarity of vision enables us to move with strength and grace at the right time and in right direction..thus achieving our goals. Right seeing is the ability to perceive situations correctly, allowing us to act at the most auspicious and powerful time. Such deliberate action will bring great blessings and abundant success. Before a great vision can become a reality there may be difficulty. Before a person begins a great endeavor, they may encounter chaos. As a new plant breaks the ground with difficulty, foreshadowing the huge tree, so must we sometimes push against difficulty in bringing forth our dreams. Wait in the power of knowing what is possible...do not waiver...remain steady...remain true to your goals and allow life to carry you. That which is worthwhile is sometimes created slowly. The rich and varied journey of life, encompassing all opposites, connecting all things. The Great Journey is full of blessings for the person who has the eyes to see. To Seek Unknown Potential It takes great courage and inner strength to change from what is known and comfortable to something which is new and fresh. That which is unknown often contains our greatest potential. 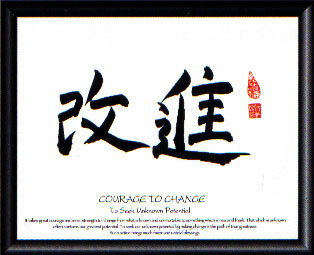 To seek our unknown potential by risking change is the path of true greatness. Such action brings much favor and untold blessings. The Art of Gratefulness. To Be truly appreciative is to receive with grace that which has been given. 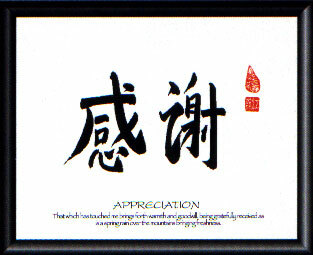 In return, thanks and warmth are given back creating a full circle of friendship and goodwill.